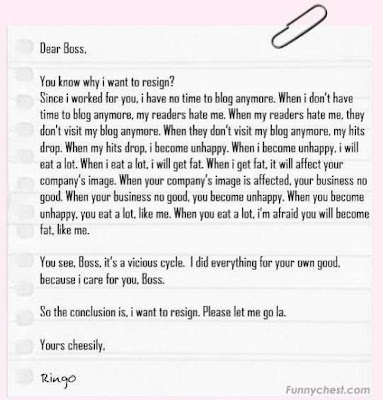 Home chain reaction draft Facebook funny funny thing Humor impact jokes letter picture resignation letter weird weird thing Resignation Letter! 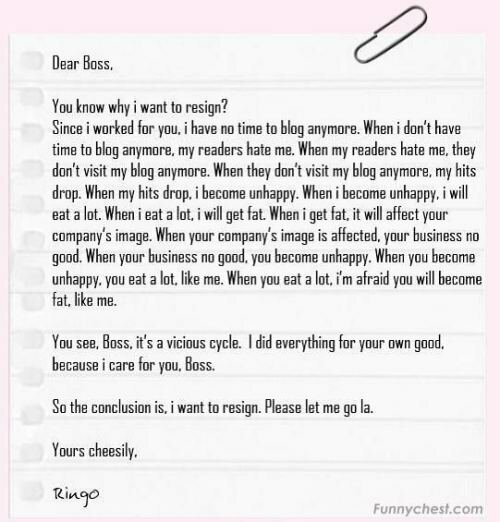 Here is a resignation letter sent to me by my friend in Facebook! Really, blogging is a very big thing nowadays! Hayz...How can people live without it!!! Read the whole letter above! You may enlarge it by clicking the image! Well, what can you say? Did you see...did you see the impact...! Small thing can cause a very big damage! With this very small hobby, it affects the person himself...his health...his readers...his boss...their company...the people served by the company...the customers...the nation...so on and so forth!